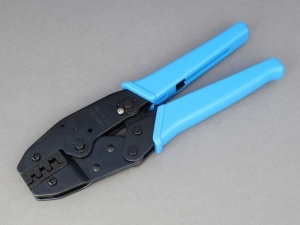 Heavy duty (daily use) professional ratchet crimping tool for producing a very high quality crimp on a wide variety of non-insulated terminals (note: cannot be used to crimp flag blade terminals). There are 3 different sized crimp locations in the jaw, each having wider section for the insulation crimp and narrower section for the conductor crimp. 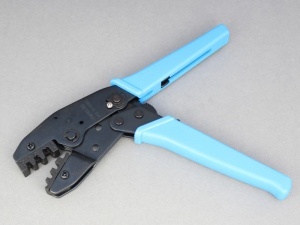 Crimps both the insulation and the conductor in one easy operation. Also features spring return and adjustable crimp pressure via dial setting on ratchet mechanism. Not to be confused with poor and cheap item on market. This is a good quality one with good casting and proper opérating mecanism at a good price. I have used it on non insulted terminals and I am very satisfied. Excellent tool, perhaps a little expensive but works well. Happy to recommend. These were purchased for crimping the AMP Superseal connectors and they worked perfectly......after a bit of practice! 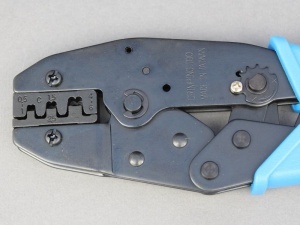 Appears to be a good solid tool leaving neat crimps.